"Lions passant" redirects here. For the flag used by the queens of the English, see Royal Banner of England. "Lion Rampant" redirects here. For the flag used by the King of Scots, see Royal Banner of Scotland. For the flag and arms used by the King of León, see Heraldry of León. For the game publishing company, see Lion Rampant (game publisher). Look up lioncel in Wiktionary, the free dictionary. 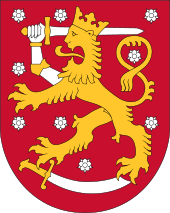 Lion as a primary charge in the coat of arms of Finland (1978 design, based on the 17th-century coat of arms of the Grand Duke of Finland). A Lion of Saint Mark, from the Echternach Gospels (late 7th century). Enamel from the tomb of Geoffrey Plantagenet, Count of Anjou (c. 1160). The shield of Conrad of Thuringia (c. 1230s), a rare example of a preserved 13th-century knightly shield, displaying the Ludovingian lion barry. 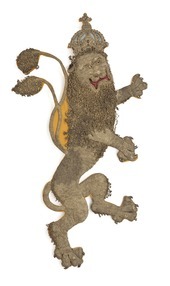 Two tailed embroidered gold lion from the end of the 17th century, Sweden. 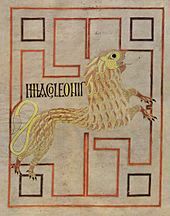 The animal designs in the heraldry of the high medieval period are a continuation of the animal style of the Viking Age, ultimately derived from the style of Scythian art as it developed from c. the 7th century BC. Symmetrically paired animals in particular find continuation from Migration Period art via Insular art to Romanesque art and heraldry. The animals of the "barbarian" (Eurasian) predecessors of heraldic designs are likely to have been used as clan symbols. Adopted in Germanic tradition around the 5th century, they were re-interpreted in a Christian context in the western kingdoms of Gaul and Italy in the 6th and 7th centuries. The characteristic of the lion as royal animal in particular is due the influence of the Physiologus, an early Christian book about animal symbolism, originally written in Greek in the 2nd century and translated into Latin in about AD 400. It was a predecessor of the medieval bestiaries. The lion as a heraldic charge is present from the very earliest development of heraldry in the 12th century. One of the earliest known examples of armory as it subsequently came to be practiced can be seen on the tomb of Geoffrey Plantagenet, Count of Anjou, who died in 1151. An enamel, probably commissioned by Geoffrey's widow between 1155 and 1160, depicts him carrying a blue shield decorated six golden lions rampant and wearing a blue helmet adorned with another lion. A chronicle dated to c. 1175 states that Geoffrey was given a shield of this description when he was knighted by his father-in-law, Henry I, in 1128. Earlier heraldic writers attributed the lions of England to William the Conqueror, but the earliest evidence of the association of lions with the English crown is a seal bearing two lions passant, used by the future King John during the lifetime of his father, Henry II, who died in 1189. Since Henry was the son of Geoffrey Plantagenet, it seems reasonable to suppose that the adoption of lions as an heraldic emblem by Henry or his sons might have been inspired by Geoffrey's shield. John's elder brother, Richard the Lionheart, who succeeded his father on the throne, is believed to have been the first to have borne the arms of three lions passant-guardant, still the arms of England, having earlier used two lions rampant combatant, which arms may also have belonged to his father. Richard is also credited with having originated the English crest of a lion statant (now statant-guardant). Apart from the lions of the Plantagenet (England and Normandy) coat of arms, 12th-century examples of lions used as heraldic charges include the Staufen (Hohenstaufen) and Wittelsbach (Palatinate) coats of arms, both deriving from Henry the Lion, the royal coat of arms of Scotland, attributed to William the Lion, the coat of arms of Denmark, first used by Canute VI, the coat of arms of Flanders (Jülich), first used by Philip I, the coat of arms of León, an example of canting arms attributed to Alfonso VII (1126), and the coat of arms of Bohemia, first granted to Vladislaus II. Coats of arms of the 13th century include those of the House of Sverre (coat of arms of Norway), the Ludovingians (the lion of Hesse used by Conrad of Thuringia), Luxembourg, the kingdom of Ruthenia (Volhynia), the House of Habsburg (the Habsburgs all but abandoned their original coat of arms after gaining the Duchy of Austria in the 1270s, but it remained in use in derived lineages such as the House of Kyburg), the kingdom of Bulgaria and the Armenian Kingdom of Cilicia (Rubenids). Unlike the eagle, which is comparatively rare in heraldry because it was reserved as an imperial symbol, the lion became a symbol of chivalry and was not restricted to royal coats of arms. The Zürich armorial (14th century) has a number of coats of arms with lions, most of them of ministeriales of the House of Habsburg. The lion in the coat of arms of Bohemia is depicted with two tails (à la queue fourchée). According to Ménestrier, this is due to a jest made by Emperor Frederick, who granted Vladislaus II, Duke of Bohemia a coat of arms with a lion coué, that is, with its tail between its legs. Vladislaus' men refused to follow this emblem, calling it an ape, so that Frederick agreed to improve the arms by giving the lion not just one but two erect tails. Note: the term segreant denotes the same position, but is only used in reference to winged four-legged beasts like griffins and dragons. A "lion passant" is walking, with the right fore paw raised and all others on the ground. A "Lion of England" denotes a lion passant guardant Or, used as an augmentation. Note: A lion thus depicted may be called a "leopard" (see discussion below). A "lion statant" is standing, all four feet on the ground, usually with the forepaws together. This posture is more frequent in crests than in charges on shields. A "lion salient" is leaping, with both hind legs together on the ground and both forelegs together in the air. This is a very rare position for a lion, but is also used of other heraldic beasts. A "lion sejant" is sitting on his haunches, with both forepaws on the ground. A "lion sejant erect" is seated on its haunches, but with its body erect and both forepaws raised in the "rampant" position (this is sometimes termed "sejant-rampant"). A "lion couchant" is lying down, but with the head raised. A "lion dormant" is lying down with its eyes closed and head lowered, resting upon the forepaws, as if asleep. Other terms are used to describe the lion's position in further detail. Each coat of arms has a right and left (i.e. dexter and sinister) side - with respect to the person carrying the shield - so the left side of the shield as drawn on the page (thus the right side to the shield bearer) is called the dexter side. The lion's head is normally seen in agreement with the overall position, facing dexter (left) unless otherwise stated. If a lion's whole body is turned to face right, he is to sinister or contourné. If his whole body faces the viewer, he is affronté. If his head only faces the viewer he is guardant or gardant, and if he looks back over his shoulder he is regardant. These adjectives follow any other adjectives of position. A lion (or other beast) coward carries the tail between its hind legs. The tail also may be knotted (nowed), forked (queue fourchée), doubled (double-queued; as in the arms of the kingdom of Bohemia), or cut off (defamed). Coat of arms of the town Senec in Slovakia - a rare example of the use of a lion in civic heraldry. Both lions and leopards may have been among the earliest beasts to appear in heraldry. The Oxford Guide to Heraldry notes that the earliest English treatise on heraldry, a late-13th or early-14th century Anglo-Norman manuscript titled De Heraudrie, mentions the crow, eagle, griffin, heron, leopard, lion, martlet, popinjay, and swan. Citing Bado Aureo, the Oxford Guide further suggests that the leopard, said to be "borne of an adulterous union between a lioness and a pard," and like a mule incapable of reproducing, may be an appropriate charge for a person born of adultery or barred from reproducing (such as an abbot). As a general rule, English heralds tend to identify lions as rampant (upright, in profile facing dexter), and leopards as passant guardant (walking, head turned to full face), but the heraldic distinction between lions and leopards is often ambiguous and in some cases may be controversial (as in the case of the royal arms of England, discussed below). Part of the confusion arises from international differences in translation or in the defining characteristics of each, particularly in charges that show some characteristics of each. English herald Arthur Charles Fox-Davies asserted in 1909 that the leopard, denoting a lion passant guardant, was a term of French origin that had "long since become obsolete in English armory. In French blazon, however, the old distinction is still observed." Fox-Davies continued, "[French heralds] term our lion passant a léopard-lionné and our lion rampant guardant is their lion-léopardé." Dutch heraldist Johannes Rietstap, however, defined a Léopard lionné as a lion rampant guardant (i.e., upright like a lion with its head turned to full face like a leopard) and a Lion léopardé as a lion passant (i.e., walking like a leopard with its head facing dexter like a lion). German-American heraldist Carl-Alexander von Volborth agrees with Rietstap's translations, in contrast to those of Fox-Davies as stated above. The true heraldic lion, according to French authors, is always to be represented in profile, or, as the ancient heralds say, showing but one eye and one ear. His attitude, also, should always be rampant or ravaging. When passant and full-faced, they blazoned him a leopard, vide Lion Leopardé: in England, however, the lions in the royal and other achievements have always been blazoned as lions, however depicted since the time of Henry III, in whose reign they were called "Leopards". Lion Leopardé ... is a French term for what the English call a Lion passant gardant. The word leopard is always made use of by the French heralds to express in their language, a lion full-faced, or gardant. Thus, when a lion is placed on an escutcheon in that attitude which we call rampant gardant, the French blazon it a Lion Leopardé. When he is passant only, they call him leopard lioné. Only when he was in this rampant attitude did the early Heralds consider any Lion to be a Lion, and blazon him by his true name. A lion walking and looking about him, the early Heralds held to be acting the part of a leopard: consequently, when he was in any such attitude, they blazoned him as "a leopard". The animal bearing that name bore it simply as an heraldic title, which distinguished a Lion in a particular attitude. These heraldic "leopards" were drawn in every respect as other heraldic "lions", without spots or any leopardish distinction whatever. This explains the usage, retained until late in the 14th century, which assigned to the Lions of the Royal Shield of England the name of "leopards". They were so called, not by the enemies of England for derision and insult, as some persons, in their ignorance of early Heraldry, have been pleased both to imagine and to assert; but the English Kings and Princes, who well knew their "Lions" to be Lions, in blazon styled them "leopards", because they also knew that Lions in the attitude of their "Lions" were heraldic "leopards". When the blazon does not specifically mention a position, the lion may be assumed to be rampant. If he is in a different position, other terminology must be used, referring to the position of his head and limbs. An early heraldic convention found in medieval blazons uses the distinction between a lion and a leopard previously employed by the ancient Greeks. In antiquity, the lion, having a heavy mane, was generally shown in profile, while the leopard, having less hair, was shown looking towards the observer. A lion looking towards the observer therefore came to be given the name of the animal usually shown in that pose. According to Neubecker, what in Old French is termed a léopard is always guardant (head turned toward the observer), thus the modern English heraldic terms "lion passant guardant", "lion passant", and "lion rampant guardant" correlate to the Old French terms léopard, lion léopardé, and léopard lionné, respectively. A small group of examples is depicted listed below. Barry lion in the arms of the German state of Hesse. The state of Thuringia uses a nearly identical coat of arms, both derived from the Ludovingian coat of arms (13th century). Shield from the coat of arms of the Kingdom of Scotland (13th century). Currently appears as the second quarter of the Royal coat of arms of the United Kingdom (or the 1st and 3rd quarters in Scotland). Arms of Llywelyn the Great (13th century), used by the Prince of Wales since 1911. Crest of the royal arms of Scotland (1837), a lion sejant affrontée Gules, imperially crowned Or, holding in the dexter paw a sword and in the sinister paw a scepter both erect and Proper. Outside of classical heraldry, lions have also found their way onto the coats of arms or emblems used by modern states in Asia, often based on traditional depictions of lions in the respective cultures or regions. Wikimedia Commons has media related to Lions in heraldry. ^ Garai, Jana (1973). The Book of Symbols. New York: Simon & Schuster. ISBN 0-671-21773-9. ^ "significant pre-figuration of medieval heraldry" John Onians, Atlas of World Art (2004), p. 58. ^ "They [animal style designs] have also been explained as totems venerated by the various clans of nomads as ancestors. Their transformation into clan symbols would have followed naturally and easily. The heraldic beasts of medieval chivalry, which include many deer and felines like those on the British royal coat of arms, may certainly be traces back to emblematic devices of later barbarian tribes from central Asia" Hugh Honour, John Fleming, A World History of Art (2005), p. 166. ^ Danuta Shanzer, Ralph W Mathisen, Romans, Barbarians, and the Transformation of the Roman World: Cultural Interaction and the Creation of Identity in Late Antiquity, (2013) p. 322. ^ Fox-Davies, A Complete Guide to Heraldry, p. 62. ^ C. A. Stothard, Monumental Effigies of Great Britain (1817) pl. 2, illus. in Anthony Wagner, Richmond Herald, Heraldry in England, Penguin (1946), pl. I. ^ Michel Pastoureau, Heraldry: An Introduction to a Noble Tradition, "Abrams Discoveries" series. Harry N. Abrams, Inc. (1997), p. 18. ^ Woodward and Burnett, vol. 1, p. 32. ^ a b Fox-Davies, A Complete Guide to Heraldry, pp. 173–174. ^ Woodward and Burnett, p. 37. ^ Hopingius, De Insigniis (1642) claimed that the use of the red lion as an emblem goes back to the Picts; cited in Alexander Nisbet. A System of Heraldry. 1. p. 265. ^ The actual etymology of León is Legion (Λεγίων). ^ Alexander Nisbet. A System of Heraldry. 1. p. 290. ^ a b Fox-Davies (1909), p. 172. ^ Fox-Davies (1909), p. 176. ^ "Segreant". Dictionary of Heraldry. 2008-08-31. Archived from the original on 2011-07-10. Retrieved 2009-03-14. ^ a b Fox-Davies (1909), p. 181. ^ Fox-Davies (1909), p. 182. ^ a b c Fox-Davies (1909), p. 183. ^ a b Fox-Davies (1909), p. 184. ^ a b Fox-Davies (1909), p. 185. ^ Fox-Davies (1909), p. 180. ^ Woodcock & Robinson (1988), p. 51. ^ Woodcock & Robinson (1988), p. 63. ^ Woodcock & Robinson (1988), p. 64. ^ Fox-Davies, Arthur Charles (1909). A Complete Guide to Heraldry. p. 173. ^ Rietstap, Johannes (1884). Armorial Général. p. XXV. ^ Volborth (1983), p. 27. ^ Clark, Hugh; J. R. Planché (1866). An Introduction to Heraldry (18th ed.). p. 156. ^ Boutell, Charles (1978) . Boutell's Heraldry. p. 79. ^ Boutell, Charles (1867). English Heraldry. pp. 84–85. ^ Neubecker, Ottfried (1976). Heraldry: Sources, Symbols and Meaning. Maidenhead, England: McGraw-Hill. pp. 111–2. ^ Neubecker (1976), p. 112. Boutell, Charles (1867). English Heraldry. London and New York: Cassell, Petter and Galpin. Boutell, Charles (1978) . S. T. Aveling (ed.). Boutell's Heraldry. London and New York: Frederick Warne & Co.
Clark, Hugh; J. R. Planché (1866). An Introduction to Heraldry (18th ed.). London: Bell & Daldy. Fox-Davies, Arthur Charles (1909). A Complete Guide to Heraldry. London: T. C. and E. C. Jack. Rietstap, Johannes (1884). Armorial Général (in French). Gouda: G. B. van Goor Zonen.